These thick, unisex slipper socks are perfect for padding around the house on chilly mornings. 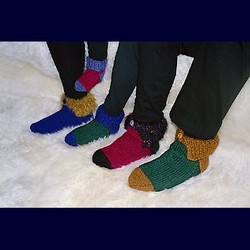 Quick and easy to knit these slipper socks make great gifts! Make in school colors or add a glitzy or furry cuff. Loads of fun!! Loveable Ladybugs Pineapple Pizzazz Crocheted Crusher Hat Baby Brights!